Bicycle commuting by Vancouver residents east living of Dunsmuir is up by 40% since 2006! 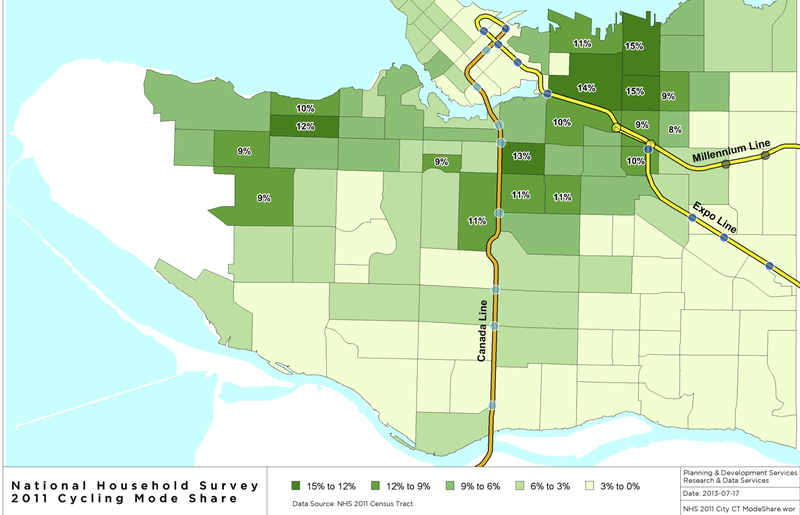 According to the just released 2011 Census results, the number of people biking to work in the area bounded by Main, 1st Avenue, Boundary and Burrard inlet went from 1,330 to 1,860, an increase of 530. These results strongly indicate that Dunsmuir Separated Bike Lanes have been very successful in encouraging more people to cycle. The results are even more impressive as this part of the city already had high levels of cycling. Now, Grandview Woodlands and Strathcona have the top three census tracts in the region with 14-15 percent of people cycling to work. The improvements to Union and Expo should further increasing cycling. This positive news and your letters to Council will help make the case to divert traffic from Union east of Gore as well. For comparison, overall in the City of Vancouver, commuting by bicycle increased from 3.7% in 2006 to 4.4% in 2011. That is 12,855 people up from around 10,380 people in 2006, a 24% increase in the number of people riding to work. In Metro Vancouver, the increase was only from 1.7% to 1.8%. These results help make the case even stronger for a network separated bicycle lanes and other all ages and abilities cycling facilities around the City of Vancouver and the region. 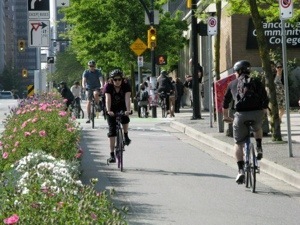 Much of the reason for the success of Dunsmuir is that it connected the already popular Adanac Bikeway to several streets downtown that either had painted bicycle lanes or had low enough levels of traffic to make them ok for cycling. Moving forward, separated bike lanes on Cornwall and Pt Grey as well as diverting traffic off Pt Grey between Macdonald and Alma will help expand the all ages and abilities network in the west side of Vancouver enabling to safely connect to the separated bike lanes on Burrard Bridge and Hornby. The increase in cycling in Kits and Point Grey was around 10%, likely reflecting the fact that there are really no all ages routes in this part of the city. Cypress, the main north south bikeway is clogged with cars during rush hour making it not that attractive to novice commuters. There was also a significant increase in cycling commuting in North Vancouver with 2.2% of people cycling to work. In the census tracts closest to the Ironworkers Memorial Bridge, cycling mode share increased from 1.3% to 1.9%, an increase of 53%. Hard to say how much of this was due to Dunsmuir though. The other good news is that Vancouver remains number two in North America among cities with more than 500,000 people after Portland where 6.3% bike commute.